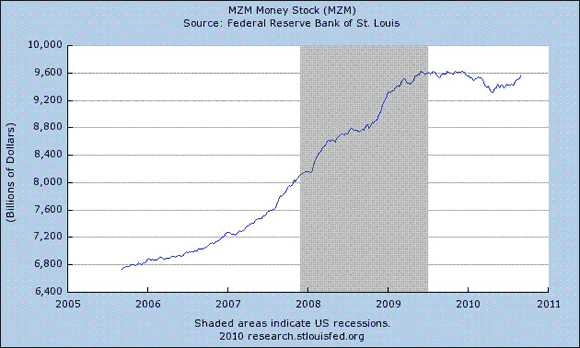 Stocks Up, So is the Money Supply. A Connection? 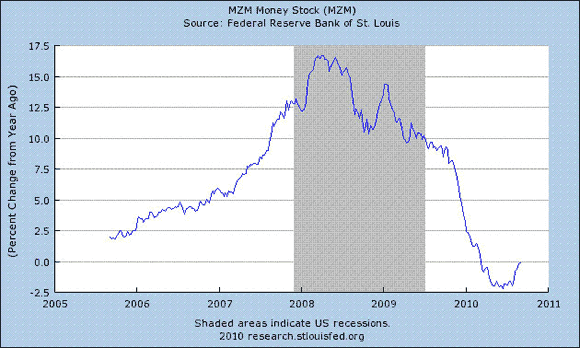 HomeBusinessStocks Up, So is the Money Supply. A Connection? September has been a good month for equities, so far. The S&P 500 jumped nearly 7% for the month through Sep. 13. For the moment, the disinflationary/deflationary scare of the summer is over. Or is it merely taking a breather? There’s no assurance that the crowd won’t turn risk averse once more. It’s all about incoming economic data…still. But looking at the latest trend in money supply figures and the slight jump in the market’s inflation expectations suggest that there’s something more in the rise in equity prices than rank speculation. Let’s start by looking at the annual percentage change in the seasonally adjusted weekly readings of MZM money. As the chart below shows, this measure of the money stock was just about flat as the end of August vs. a year ago. That’s still cutting it close, assuming the economy is still at risk of further slowing. But no change in money supply on a year-over-year basis is higher than the 2% decline that prevailed earlier this year. A comparable shift higher is also visible in the actual MZM totals in recent weeks, as the second chart shows. Other measures of money supply, such as M1, also suggest that the Fed has reversed course from previous months and is now pumping up the printing presses. Overall, it’s a notable change from, say, the end of June, when the annual pace of change in the money supply was falling like a rock, and the stock market wasn’t doing much better. Confirmation that there’s been a change can be found in the market’s inflation outlook, which has risen as well. Using the yield spread between nominal and inflation-indexed 10 year Treasuries, the crowd’s estimating future inflation at 1.8% a year, as of yesterday. That’s up slightly from just under 1.5% in late August, as we noted at the time. Is this the all-clear sign for sweeping away the D risk worries that have plagued the market lately? Maybe, maybe not. It depends on what the next batch of economic numbers tell us. Meanwhile, there’s the chatter from the monetary mavens to digest. St. Louis Fed President James Bullard–a voting member of the FOMC–told The Wall Street Journal a few days back that a 1% rate of consumer price inflation is “not extremely low.” That worries Nick Rowe, who wonders if the Fed’s 2%-2.5% inflation target (albeit, an assumed target) is in a deflationary spiral of its own..
Is Bullard’s comment a sign that the Fed is laying the groundwork to permit a lower rate of inflation to prevail vs. what the bank used to anticipate? That certainly jibes with the latest outlook from the San Francisco Fed, which anticipates consumer price inflation of around 1% for the foreseeable future, as the chart from the bank’s Sep. 8 Fed Views publication shows. 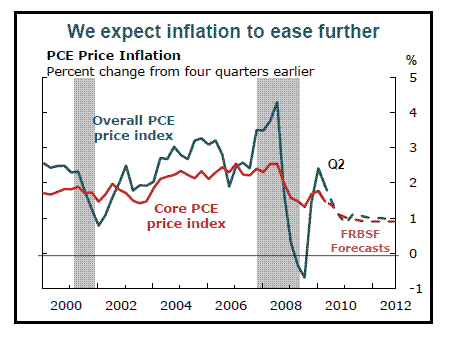 Many pundits will celebrate a lower outlook for inflation, reasoning that lower prices are good for everyone. There’s some logic there, but it also comes with a fair amount of risk in the current climate. A 1% inflation rate is just dandy if the economy is humming along. If it’s struggling, well, that’s a recovery of a different color. If 2% inflation gets you 1%, then 1% may risk falling to zero if something goes wrong this autumn. Unless the Fed decides otherwise. So, yes, the jump in stocks so far this month suggests that the deflation scare has abated for the moment. And the burst of optimism seems tied to better monetary numbers. But it’s still early to say for sure. Meanwhile, it’s best to assume that there’s one more weasel in the hen house.